Tire Cord And Tire Fabrics Market size was USD 3.85 billion in 2015 and is projected to expand at more than 5% growth. Global tire cord & tire fabrics market size is mainly driven by escalating automotive industry across the globe. China, South Korea, Japan, India, and U.S. lead the global automotive industry, these five countries contributed more than 55% to the global cars and commercial vehicles production in 2015. China and India, with their huge domestic market base, are also expected to become major markets in the near future. Growing middle class population, particularly in China and India, have prompted European and American car manufactures including Mercedes-Benz, Audi and BMW to enter the Asian market with small cars, designed specially to meet the requirements of this region. In addition, the global vehicle production, including personal and commercial, was approximately 90 million units in 2015. The product is an essential component used in the automotive production. Therefore, the industry growth is directly propelled by the booming automotive demand. U.S. is one of the most important country for automotive manufacturers as it accounts for more than 65% of all personal vehicles and commercial vehicles sold in North America. Uplifting U.S economy post 2008 economic downturn will positively influence the tire cord and tire fabrics market size over the projected timeframe. The U.S. automotive industry has gradually improved since 2010, witnessing a steady growth. The personal vehicle and commercial vehicle sales in the U.S. are expected to surpass 10 million units and 12 million units, respectively, by 2024 owing to stimulate business growth over the projected period. Automotive sales in Europe are declining owing to moderate GDP growth, with total commercial vehicles sales close to 3 million units in 2005 and around 2.4 million units in 2013. Similarly, personal vehicle sales went down from around 15 million units to over 12 million units during the same period. This trend shall hamper the global tire cord and tire fabrics market share over the forecast timeframe. There had been a splurge in capacity addition for nylon and polyester tire cords in the Asia Pacific, specifically in China. Operating profits of major industry participants were hurt due to excess capacity expansion and comparatively low product demand in the region. This may further hamper business growth by 2024. However, the emergence of bio-based and environmentally sustainable alternatives to conventional tire cord materials will bring new growth prospects to the industry players, subsequently propelling the business growth. Steel tire cord and tire fabrics market share was valued at over USD 1 billion in 2015. The segment growth is mainly propelled by the growing radial tire demand in North America. Wherein, steel reinforcement is the backbone of a radial tire owing to drive growth. Steel cord enhances the mechanical strength and tire stability and hence is extensively used in the commercial vehicles. Polyester is anticipated to witness gains exceeding 5% CAGR over the projected period. These are extensively used in passenger car tires. It is also highly preferred in the industry owing to its desirable physical properties and low cost. Rapidly growing personal vehicle segment across the globe on account to improved consumer disposable income along with upgraded lifestyles will complement business growth. North America, led by the U.S. tire cord and tire fabrics market size was slightly over 800 million in 2015. Uplifting U.S. economy is one the prime factor propelling the regional growth significantly. In addition, the region has massive customer base for high end luxury cars and SUVs, which further complements regional growth. Asia Pacific, particularly led by India, Japan, China, Indonesia, dominated the global tire cord and tire fabrics market share in 2015. Increasing per capita disposable income to consumers in China and India has substantially propelled the personal automotive sales in the region, consequently propelling business growth. Furthermore, the region is gathered attention from numerous automotive manufacturers including Volkswagen and Nissan towards setting up manufacturing and sales facilities in the region, owing to positively influence the regional growth by 2024. The global tire cord and tire fabrics market share was largely consolidated in 2015. The major industry participants contributing the global share includes Hyosung Corp., Bekaert, Kordsa Global Inc., SRF Ltd. and Kolon Industries, Inc. other prominent participants are Teijin Ltd., Kordarna plus A.S., Firestone Fibers & textile Co., Cordenka GmbH, Tokusen USA and Milliken & Co. Inc.
Companies such as Bekaert are involved solely with steel cord manufacturing, whereas companies such as Hyosung Corporation and Kordsa Global are involved in manufacturing more than one type of tire cord material. For instance, Hyosung Corporation is a leading manufacturer of polyester tire cord. In addition, Hyosung Corporation is the market leader in the tire cord and tire fabric market share. The company is the industry leader in the polyester tire cord with considerable share in the steel tire cord segment as well. Also, Hyosung Corporation is involved in the production of polyethylene naphthalate tire cords and aramid, in smaller capacities. Automotive tire is the most complex engineered product, which requires a range of raw materials such as rubber & artificial rubber, cord fabric carbon black, steel and different chemicals. These cords are tire reinforcing materials, which provides dimensional stability and acting as supports for the vehicle weight. These also help to keep tires in shape in different road conditions. The tire cord and tire fabric market is directly influenced by the automotive demand and other vehicles that need tires for locomotive ability. The industry is boosted by the production intensity and market appetite for new vehicles, especially in emerging economies with rapidly increasing GDP and purchasing power among people. 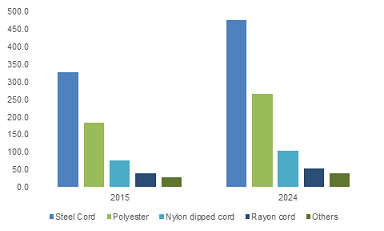 Moreover, the revived growth of automotive manufacturing in the U.S., partially influenced by government initiatives to lift hybrid and electric vehicles carbon black will positively influence the tire cord and tire fabric market size by 2024.